During October of 1974, the Saturday Evening Post published a “Guide to American Wineries.” This article was probably the first discussion of bonded Midwestern Wineries to appear in a national publication. Recently, Midwest Wine Press researched the status of some of the “original” Midwest wineries. Some are long gone, but many still remain open for you to visit today. 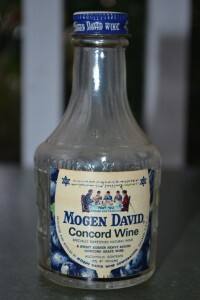 Mogen David Wine Company– Starting in the 1930s, Mogen David made several million gallons of wine annually in Chicago. Most of the wine was made from Concord grapes. Some of these grapes undoubtedly came from Michigan vineyards. At some undocumented time, Mogen David moved from Chicago to Westfield, NY. Today, Mogen David is part of The Wine Group, maker of Cupcake Wines. Thompsen Winery– This Monee winery was the successor to Ramey and Allen Champagne Cellars, which opened in 1963. Drifting of the herbicide 2,4-D forced the closure of the winery in the 80s. Rare steam engine trains were displayed on the former winery property until 1999. Gem City Wine Company– Today, this Nauvoo winery is called Baxter’s Vineyard and Winery. The winery is operated by the fifth generation of the Baxter family to make wine on the banks of Mississippi River. Not surprisingly, Baxter is the oldest operating winey in Illinois and one the most historic wineries in the Midwest. Oliver Wine Co.- This winery is now called Oliver Winery in Bloomington, Indiana. Oliver is currently the largest winery in the Midwest with production of about 4.5 million bottles per year. The current owner of the winery is Bill Oliver, son of the late William Oliver, Indiana University law professor and founder of Oliver Winery. Treaty Line Wine Cellar– This Brownsville winery closed in 1975, four years after it opened and just after the Saturday Evening Post article was published. Winery founder Dr. Donald McDaniel was instrumental in getting the Indiana Small Winery Act passed, which paved the way for the 73 wineries that operate in Indiana today. Tabor Hill Winery– This winery now produces over 150,000 gallons of wine per year on the site of the original facility which opened in 1968. During 1984, Tabor Hill bought Bronte Champagne and Wines- which at one time was Michigan’s largest winery- and hired their legendary winemaker, Angelo Spinazze. More recently, Rick Moersch left Tabor Hill in 1992 to start his own Southwest Michigan, Round Barn. Tabor Hill’s Demi Sec, a Vidal Blanc wine, is the winery’s best seller. 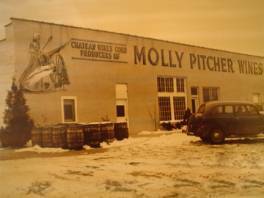 Molly Pitcher Wine Corp.– Founded in 1934, this winery went through several relocations and name changes before closing in 1991. At the time it ceased operations, the winery was known as Berrien Vintner Cellars and was located in Harbert. In it’s heyday during the 70’s, Molly Pitcher, produced over 200,000 gallons of wine a year that was sold in 48 states. 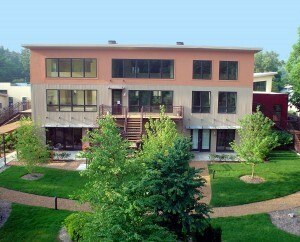 The old Harbert production facility on Red Arrow Highway is now a 14 unit condo development called The Vineyard Lofts. Some of the old concrete fermentation vats are now part of kitchen and bedroom designs for the condos. Bronte Champagnes and Wine- Opened in 1933, six months before the repeal of Prohibition, Bronte Wines was sold to Tabor Hill Winery during 1984. During its peak, Bronte was probably the most productive winery in Michigan history producing 800,000 gallons of wine a year in its Detroit facility. Bronte was the first to bottle the popular ‘Cold Duck” wines of the 1960’s and 70’s. 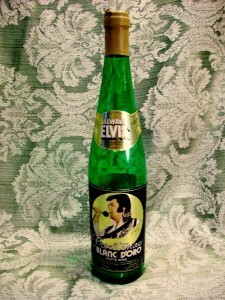 Frontenac Winery’s “Always Elvis” wine. St. Julian Wine Company- This winery has been making wine in the same Paw Paw Michigan location since 1936. But the history of St. Julian goes all the way back to 1921 in Windsor Ontario. That’s when an Italian immigrant named Mario Meconi started Border City Wine Cellars. Today, after several relocations and name changes, St. Julian produces over 100,000 cases of both wine and sparkling grape juice annually in Southwest Michigan. Mount Pleasant Winery– Two brothers started this winery in 1859, but the vineyard was burned in 1920 and the federal government shut down production. During 1966, Lucian and Eva Dressel bought the property and replanted the vineyard. The first American Viticultural Area (AVA) designation in the U.S. was granted to Mount Pleasant in 1980. Today, Mount Pleasant has tasting rooms in both Augusta and Branson and produces around 120,000 gallons of wine annually. Stone Hill Winery– After the Civil War, Stone Hill was the second largest winery in the U.S., shipping 1.25 million gallons per year. Prohibition brought the end of Stone Hill until 1965 when Jim and Betty Held bought the property and began restoring it. Annual production is now over 250,000 gallons per year. The winery and cellars is on the National Register of Historic Places and is open to the public for a fee. Francis Gohlike Winery– According to a history written by the late David Bailly of Alexis Bailly Vineyard, Minnesota bonded license #2 was issued to Leland Gohlike for a small winery in the caves along the St. Croix River in Stillwater. Gohlike planned to make a small amount of wine from concentrate, but it never sold commercially. Instead, the first Minnesota winery license was given to the Old Sibley House Winery in 1949, but the winery apparently closed before the Saturday Evening Post article in 1974. 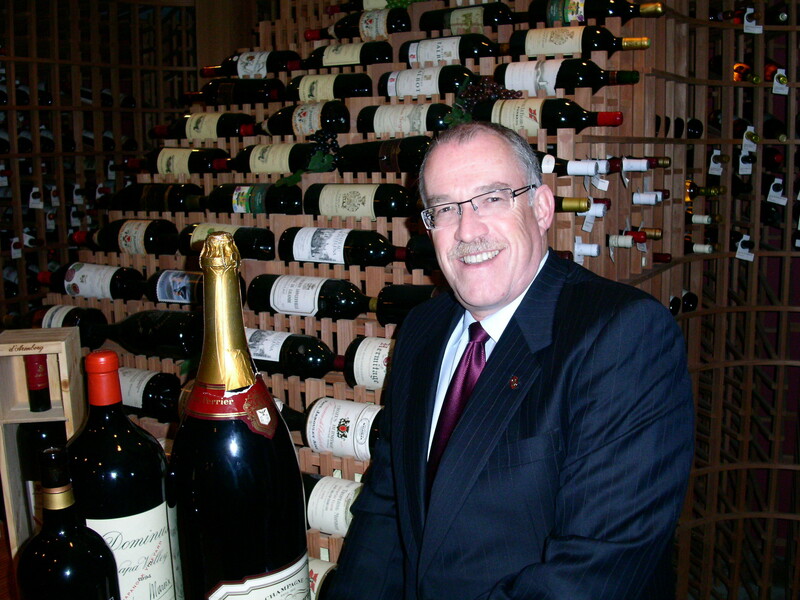 During 1976, David MacGregor become the first winery to make wine from Minnesota grapes. MacGregor’s winery was called Lake Sylvia Vineyard in South Haven. As for David Bailly, he’s credited with starting a vineyard in ’73, but his tasting room did not open until 1978. 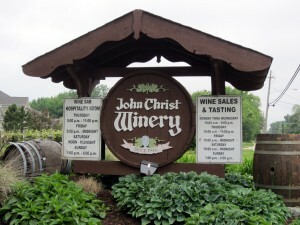 John Christ Winery– One of of the oldest post-Prohibition wineries in the Midwest, John Christ Winery began production in 1946 near Lake Erie. The original owner, John Christ, was a Macedonian immigrant who came to the U.S. to grow wine grapes. Today, the current winemaker, Jack James, continues to make award winning estate grown wines. During 1937, the winery was acquired by the Mon Ami Champagne Company. Mon Ami’s website says production in the ’30’s was as much as 100,000 gallons per year. Mon Ami still makes a Pink Catawba blush wine which is served in a restaurant that’s located in the historic winery. Newberry Wine Company– This winery was founded in 1972 by Jim and Sandy Pape in Cedarburg, Wisconsin. For a time, the winery was called Stone Mill Winery and was well known for cherry wine. In 1990, the winery was purchased by the Wollersheim Winery, the largest winery in Wisconsin. Wollersheim refurbished the original 1864 structure and renamed the winery Cedar Creek Winery. Today, Cedar Creek Winery produces top quality grape wines which can be tasted at the winery. Tours are also available.